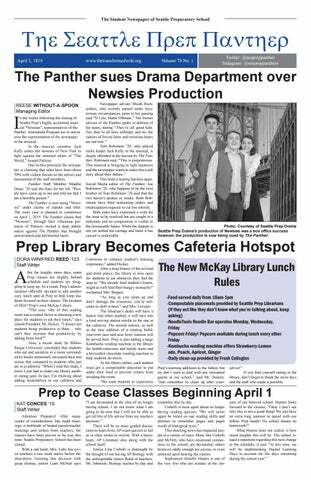 n the weeks following the closing of Seattle Prep’s highly acclaimed musical “Newsies”, representatives of the Panther Journalism Program are in unrest over the representation of the newspaper in the musical. In the musical, newsboy Jack Kelly unites the newsies of New York to fight against the immoral editor of “The World,” Joseph Pulitzer. Due to this portrayal the newspaper is claiming that sales have been down 70% with violent threats on the editors and harassment of the staff members. Panther Staff Member Maddie Deasy ’20 said she fears for her life. “People have come up to me and told me that I am a horrible person.” The Panther is now suing “Newsies” under claims of slander and libel. The court case is planned to commence on April 1, 2019. The Panther claims that “Newsies”, through their villainous portrayal of Pulitzer, incited a deep public outcry against The Panther that brought unwarranted and detrimental harm. Newspaper adviser Micah Richardson, who recently passed under mysterious circumstances, prior to his passing said “If I die, blame Othman.” The former advisor of the Panther spoke in defense of his team, stating “They’re all good kids. Yes, they’re all here willingly and no, the rumors of forced labor and torturous hours are not true.” Tom Robinson ’20, who played strike leader Jack Kelly in the musical, is deeply offended at the lawsuit by The Panther. Robinson said, “This is preposterous. This musical is bringing to light injustices and the newspaper wants to make this a sob story about their failure.” This feud is tearing families apart. Social Media editor of The Panther, Joe Robinson ’20, who happens to be the twin brother of Tom Robinson ’20 said that the two haven’t spoken in weeks. Both Robinsons have filed restraining orders and emancipation requests to cut ties entirely. Both sides have expressed a wish for the issue to be resolved but are caught in a stalemate and no compromise is visible in the foreseeable future. While the dispute is not yet settled the carnage and harm it has caused is undeniable. Photo: Courtesy of Seattle Prep Drama Seattle Prep Drama’s production of Newsies was a box office success however, the production is now being sued by The Panther. selves!” If you find yourself eating in the library, don’t forget to thank the snow days and the staff who made it possible. ith the annual game of Senior Assassin kicking off again, Seniors are strapped, planning, and paranoid. However, this year the beloved game has a brand new twist, Senior Assassin is now: Teacher Edition. It all happened one sunny day in the OSL. Owen Hendricks ’19, who is the organizer of this whole event, was in a major planning mode. Witnesses say he was talking to himself and doing extreme calculations with Randomeister all while counting his box of money and hunting down seniors who had not paid or given him a notecard with their phone number. Mr. Stearns was amazed and intrigued by the whole process. He wanted to take part too. Suddenly, Stearns had a realization: “Man, assassin is the greatest thing ever! Why would I ban it?! This game is truly representing the pinnacle of Seattle Prep and must be shared with our faculty members.” As Stearns approached Hendricks with timidity, he cautiously asked if there could be any possibility this game could be extended to all faculty members at Prep. throughout the halls with glee. Quite a sight. Now, time to fast forward. The first round of assassin typically seeks to weed out the weak and lazy players. The rounds that follow begin to get increasingly more discreet and the sneaky tactics of teachers and students alike become heightened. Trust and security is only found within the physical boarders of Seattle Prep because once one steps off the campus, they are vulnerable and risking their life. Finally, the moment has come; the final round. The players left are (as coincidence would have it): Mr. Stearns, Mrs. Tordillos, Coach Scott, Grace Jordan, Ethan Anderson, Mr. Arthur, and myself. As if this was not crazy enough; my father is my target. The future of the victors of assassin is still unknown, however, let’s just say that a certain Craig Arthur is on edge. As he is obviously no longer safer at home, he has moved out of the house and refuses to text me back or embarrass me in the halls. Arthur’s Find My Friends Location has been turned off, but rumor has it he has moved back in with his mother for safety. The moral of this is to stay strapped with your Nerf guns and be on the lookout, you never know who is around the corner watching your every move (@craigarthur). andy Crush. Candy Crush. Crush. Candy Crush. Candy Candy Crush. Candy Crush. Crush. Candy Crush. Candy Crush. Crush. Candy Crush. Candy Crush. Crush. Candy Crush. Candy Crush. Crush. Candy Crush. Candy Crush. Crush. Candy Crush. Candy Crush. Crush. Candy Crush. Candy Crush. Crush. Candy Crush. Candy Crush. Crush. Candy Crush. Candy Crush. Crush. Candy Crush. Candy Crush. Crush. Candy Crush. Candy Crush. Crush. Candy Crush. Candy Crush. Crush. Candy Crush. Candy Crush. Crush. Candy Crush. Candy Crush. Crush. Candy Crush. Candy Crush. Crush. Candy Crush. Candy Crush. Crush. Candy Crush. Candy Crush. Crush. Candy Crush. Candy Crush. Crush. Candy Crush. Candy Crush. Crush. Candy Crush. Candy Crush. Crush. Candy Crush. Candy Crush. Crush. Candy Crush. Candy Crush. Crush. Candy Crush. Candy Crush. Crush. Candy Crush. Candy Crush. Crush. Candy Crush. Candy Crush. Crush. Candy Crush. Candy Crush. Crush. Candy Crush. Candy Crush. Crush. Candy Crush. Candy Crush. Crush. Candy Crush. Candy Crush. Crush. Candy Crush. Candy Crush. Crush. Candy Crush. Candy Crush. Crush. Candy Crush. Candy Crush. Crush. Candy Crush. Candy Crush. Crush. Candy Crush. Candy Crush. MISSION STATEMENT The Seattle Prep Panther is a student created, student-run journalism program which provides the Seattle Prep community with accurate, informative articles and media while practicing the components of a professional newspaper. The staff aims to create an informative newspaper and website which focus on issues important to our high school community. Crush. Crush. Crush. Crush. Crush. Crush. Crush. Crush. Crush. Crush. Crush. Crush. Crush. Crush. Crush. Crush. Candy Crush. Crush. Crush. Crush. Crush. Crush. Crush. Crush. Crush. Crush. Crush. Crush. Crush. Crush. Crush. Crush. Crush. Crush. Crush. Crush. Crush. Crush. Crush. Crush. Candy Crush. Candy Crush. Candy Crush. Candy Crush. Candy Crush. Candy Crush. Candy Crush. Candy Crush. Candy Crush. Candy Crush. Candy Crush. Candy Crush. Candy Crush. Candy Crush. Candy Crush. Candy Crush. Candy Crush. Candy Crush. Candy Crush. Candy Crush. Candy Crush. Candy Crush. Candy Crush. Candy Crush. Candy Crush. Candy Crush. Candy Crush. Candy Crush. Candy Crush. Candy Crush. Candy Crush. Candy Crush. Candy Crush. Candy Crush. Candy Crush. Candy Crush. Candy Crush. Candy Crush. Candy Crush. Candy Crush. Candy Crush. Candy Crush. Candy Crush. Candy Crush. Candy Crush. Candy Crush. Candy Crush. Candy Crush. Candy Crush. Candy Crush. Candy Crush. Candy Crush. Candy Crush. Candy Crush. Candy Crush. Candy Crush. Candy Crush. Candy Crush. Candy Crush. Candy Crush. Candy Crush. Candy Crush. Candy Crush. Candy Crush. Candy Crush. Candy Crush. Candy Crush. Candy Crush. Candy Crush. Candy Crush. Candy Crush. Candy Crush. Candy Crush. Candy Crush. Candy Crush. Candy Crush. Candy Crush. Candy Crush. Candy Crush. Candy Crush. Candy Crush. Candy Crush. Candy Crush. Candy Crush. Candy Crush. Candy Crush. Candy Crush. Candy Crush. Candy Crush. Candy Crush. Candy Crush. Candy Crush. Candy Crush. Candy Crush. Candy Crush. Candy Crush. Candy Crush. Candy Crush. Candy Crush. Candy Crush. Candy Crush. Candy Crush. Candy Crush. Candy Crush. Candy Crush. Candy Crush. Candy Crush. Candy Crush. Candy Crush. Candy Crush. Candy Crush. Candy Crush. Candy Crush. Candy Crush. Candy Crush. Candy Crush. Candy Crush. Candy Crush. Candy Crush. Candy Crush. Candy Crush. Candy Crush. Candy Crush. Candy Crush. Candy Crush. Candy Crush. Candy Crush. Candy Crush. Candy Crush. Candy Crush. Candy Crush. Candy Crush. Candy Crush. Candy Crush. Candy Crush. Candy Crush. Candy Crush. Candy Crush. Candy Crush. Candy Crush. Candy Crush. Candy Crush. Candy Crush. Candy Crush. hroughout the second semester Seattle Prep has missed roughly five days of school solely because of the snow. Many students enjoyed the first two snow days as it meant getting to sleep in after “retreat-a-palooza” and sledding with friends. However, it was in the following snow days when students began to beg for a normal school day again due to the dreaded Digital Learning Days. Students were stuck inside their houses with hours of homework all while seeing the beautiful white snow fall outside their windows. However, the teachers did not have the same reaction, in fact they loved the Digital Learning Days. They loved them so much, they made the executive decision to add a required five weekdays of digital learning over spring break. Collegio teacher Ms. Healy stated, “The teachers and I felt the time and effort put into the Digital Learning Days have helped the student’s dedication and time management skills and decided to implement another week of this to see them become even more efficient.” Now, students at Prep must be wondering, WHY? The simple explanation to this addition of Digital Learning Days is that it relieves the added stress of homework and tests when the break is over. Teachers explained that every time a break concludes they become filled with stress and complaints from students about the overload of homework and tests filling their class periods. Teacher figured that while the initial reaction to Digital Learning Days over break would be negative, students would eventually realize the decrease in “aftermath” stress and everyone in the Seattle Prep community will ultimately be happier. would highly recommend that students discuss cancelling their trips with their parents in order to make time for Digital Learning Days because we know that it will benefit them to get more time.” Seattle Prep students and administration clearly have different opinions on the return of Digital Learning Days, but as always, the teachers have the last word and judging by that, Digital Learning Days will be back. A word of advice to all students, hunker down and get ready for a spring break full of surface screens and online teaching lessons because there is no going back. purposefully do bad work on Wednesdays to prove a point.” Even some of the teachers are not on board with getting rid of the late starts. German teacher, Frau Khouri, values her beauty sleep or in other words, “Schönheitsschlaf”. She said, “Das ist die schlechteste Idee, die ich je gehört habe. Meine Schüler sind an späten Starttagen bereits miserabel, ich kann mir nicht vorstellen, wie sie aussehen würden, wenn sie überhaupt keinen späten Start hätten. Schlechte schlechte Idee.“	Students and even some faculty dread the 2019-2020 school year all due to no late starts. It will be a long and sleepless year Seattle Prep, so soak in the late starts in while you can. school sched POST MALONE ‘21 Staff Writer his 2018-19 school year, there seems to be a shortage of late starts on Wednesdays. This has been alarming to the students at Seattle Prep, sparking rumors around campus that there will not be late starts for the following school year. Last year Prep had 35 late starts, and by the end of this year we will have had 22.
poirpAOPRHJHBSLAPAPAJRENRNRMWK SDJCNEMKLAKNSKDFJSERBTJHI SFJISNJRTIEIOSFINEJRBHWBTEK ;PWOEUJROIHWERNWRJSDFKZF,DM AS,REJKIEJRIJJKPOOOEOWNe WBCKSHYRNJSNKOCJSIWHNRKSte starts on Wednesdays. This has been alarming to the students at See attle Prep, sparking rumors around campus that there will not be late starts for the following school year. Last year Prep kfsaerhwerjpowuae dosajbdfjkasgfuicgsdeuwbrjjkefe hiszchjenjakjhdkjnfjekwrfjsjhfh. laid, polyester skirts, polo shirts and thin sweatshirts. This will be the new image of Prep starting next school year. Students will be required to wear school uniforms starting in August of the 2019-2020 school year. Teachers and administrators approved switching the dress code to the requirement of a school uniform. At the end of semester 1, a staff meeting was held to come to an agreement on this new requirement. Many other members of the staff believe that this will be a positive change for the school because it will create unity, reduce JUGs and distinguish Prep students. These uniforms will consist of the traditional Catholic school dress, similar to what many students wore in elementary school. Many teachers are tired of giving JUG to students who violate the current school dress code. Whether it is ripped jeans, immodest clothing or clothes with holes or tears, teachers are constantly seeing these violations. Dean of Students Mr. Stearns believes, “This will be easier for faculty and staff, as it will create less distraction in the classroom and more focus on what the students are learning.” There has been recent debate on what the uniform will look like. This includes what color the plaid skirts and sweatshirts will be. There are suggestion boxes located in all offices for students to express their preferences. The Prep staff believe that this a good way to make the students feel a part of the switch because they will be able to offer input. Another positive aspect to this switch is that Prep will look more cohesive and easier to spot in a crowd and if students wander from campus. “We will always know if a student is from Prep because of the new uniform,” said Stearns. Photo: NATALIE NOWAK Panther staff members Cece Brown and Paige Stanley model new uniforms which all Prep students will wear for the 2019-2020 school year. While there are many benefits to this for them. Sophomore Sophie McDowall Stearns believes that Prep implementswitch that will be, many drawbacks have said, “I think it will make my life so much ing this change will most likely cause other been expressed by members of the student easier, I won’t have to choose what to wear school such as Blanchet and Holy Names body. Áine Shimmelman ‘19 believe that each day.” to do the same. Despite petitions and comthe switch, “…takes away from personal Another argument that the Prep fac- plaints, this change will be implemented expression. Clothes are a way to show oth- ulty have used along with this switch is because of the various benefits that it will er’s your personality.” that families will not have to buy as many bring. These include the convenience for Similarly, Bryce Whitney ‘21 shared new clothes for their students, because they faculty and staff to not have to give out JUG that, “Uniforms would be very uncomfort- can wear the same pieces every day. While for student dress code violations and for the able, especially with all the stress that Prep many students have a strong opinion on this cohesiveness and student unity that Prep students experience throughout the year.” switch, seniors reply, “Ha-ha, I’m glad that will present to society. Seattle Prep will be Contrasting to these critiques, many we don’t have to deal with this. Perfect tim- seen as a unified and professional institustudents feel this would be a positive switch ing!” said Bella Metcalf ‘19. tion. es un país, y eres estúpido si creíste que es un país. ¡Qué lástima! Cada día cuando volvo de la escuela, la primera cosa que hacer no es mi tarea porque nunca hizo me tarea. Quiero ser un ranchero entonces puedo cocinar mucho. Cada verano mi familia y yo vayamos al Rancho de “Hidden Valley”. Tenemos una otra casa en este lugar. 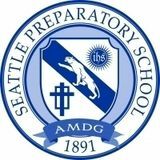 Este cambio cerca la lengua oficial que hablamos en la escuela de Seattle Prep es muy importante, especialmente durante esta sección de la historia de los Estados Unidos. No hay muchas escuelas que hablan otras lenguas de inglés, entonces, Seattle Prep es revolucionario en esta categoría de la cultura. Ahora, la escuela no tiene muchos estudiantes quienes hablan español, cual significa que muchos estudiantes necesitan comenzar a aprender la lengua. No será un proceso muy difícil, porque tenemos maestros de español buenos, como Concha Navarro y Señor Café. Ellos pueden asistir los estudiantes nuevos, y todos quien no hablan español durante el transición. easy way for me to look like I have a clean, sophisticated outfit.” Next up- mixed animal prints. and an animal print bow to top off the look! Finally- Moon Shoes are back! A distant memory of TV commercials advertising these spectacular shoes may be ringing in the back of Prepsters’ minds. Moon Shoes are mini trampolines for each foot! Talk about easy transportation from AMH to Ignatius! Fitted with purple and green Velcro, these babies can take any ordinary outfit from 0 to 10. To wrap up the Spring Trend report- jewelry is thriving! Silly Bandz have made appearances on the wrists on Prep fashionistas in recent weeks. Dig them out of abandoned drawers and show off your shapes! From dinosaurs to money signs to guitars, there is something for everyone! Set the hallways on fire with these trendy picks! fairs, but you cling to these moments of attraction to prove that your life matters at all. Scarlet Letter You had an affair with a Puritan minister named Dimmesdale. You are passionate but also strong, enduring years of shame. You equal both your husband and your lover in your intelligence. Your alienation puts you in the position to make observations about your community. The Things They Carried You are a pacifist and rationalize your participation in Vietnam by concluding that your feelings of obligation toward your family and country are stronger influences than your own politics. You use your ability to tell stories to deal with your guilt and confusion over the atrocities you witnessed in Vietnam Great Gatsby You are a fabulously wealthy young man living in a Gothic mansion in West Egg. You are famous for the lavish parties you throw every Saturday night, but no one knows where you come from, what you do, or how you made your fortune. You were born James Gatz on a farm in North Dakota. Beloved You are the embodied spirit of Sethe’s dead daughter. You are the age the baby would have been had it lived, and you bear the name printed on the baby’s tombstone. You first appear to Sethe soaking wet, as though newly born, and Sethe has the sensation of her water breaking when she sees you. TATBILB cast, some are disappointed. “I don’t understand the hype. It’s just a movie and they’re just actors. Prep can do better” says Kate Oest-Larsen ’22. Some may ask, how are they going to explain the sudden change of school? Susan Johnson, the director of the film explains that Prep’s environment and campus is a perfect fit for the second movie. The commons, hallways, plaza, and Collegio classrooms will all be featured in the new movie. Starting, June 20th , 2019 the cast and crew of TATBILB will take over Prep, and lucky Summer Prep students might have a chance to meet the cast or see them walking the halls. Director Johnson has also expressed a need for extras for many scenes in the new movie. Students should send a professional headshot, video audition and creative resumé by fax no later than 4:79pm on July 34th if interested. Photo: GABI JEAKLE Noah Centineo, star of TATBILB spotted on the plaza as part of a scouting trip earlier this year. TATBILB will shoot its sequel on the Prep Campus beginning in June 2019.
tle bit scared. This is where weaker people would’ve given up. But I was persistent. With the administration and Mr. Smith onto me, I knew I needed to be stealthier in my inspection. I was ready for a long and tedious investigation. I had no idea what my next move would be. Just when I was almost out of hope, I was given a lifeline, by the grace of God. I was called down to the attendance office two days after my meeting with Mr. Hickey. Mr. Stearns wanted to meet with me. I sat down, and he told me, “Will, I’ve been trying to expose Mr. Smith for the longest time. You must have the courage to speak out.” This journey has been a long and perilous one. I played a high-risk highreward game. I had much to lose, but everything to gain. With this, I issue my declaration: Mr. Smith is from Oregon, not Manchester. Photo: Mac Donald Coach Durand limbers up prior to his new Window Yoga Class. Durand converted the traditional Window Lifting class to Yoga in order to help students gain flexibility and become more centered. Dome, and the newly renovated Key Arena. The soccer games will be held at Alaska Airlines Stadium, Centurylink Field, Safeco Field, and Memorial Stadium. To the Mariner fans, do not worry, the Mariners will be playing out of the Husky Ball Park from July 21 to September 2. The plans for these Olympic games heavily rely on the University of Washington who came out with a statement supporting these games: “As an institution we look forward to being a major partner with the IOC in promoting the 2028 Olympic Games here in Seattle.” We are excited to expand the Husky brand across not only the state but with the globe, but most of all, Happy April Fools! look so good on the ice.” Because this is so new to Prep, there will be weekly practices for ice skating and stick skills in the summer. Stay tuned for updates on Instagram, @prephockey. Reese can’t wait to lace up her skates in her home rink at Prep. There will be both a girl’s program and a boy’s program. Cole said, “I can’t wait to see all the students at Prep get out there on the ice, it’s gonna be great.” So Prep, go grab your skates! Estimated retail: $17.38 For all your senior needs. Only $19.99! Available in the following colors: Injury time indigo, money is a social construct green, socialist red, 6th cup of coffee brown, classic yellow. Julie Andrews visits you in a limo and gives you a contact prescription. careful with dairy for the next four years. Gemini: Very soon, you will find your long-lost twin following you around. Cancer: This upcoming Thursday you’ll be learning a lesson about to whom you should lend power tools, cheese graters and olive oil. are expected to increase in number. ask you a few riddles. A troll. The love of your life is a troll. Sagittarius: Stay away from three-wheeled objects this week. 73 CENT TICKETS TO VISIT... From Safeco to T-Mobile to now Mrs. Fields, the Field is available to visit! Get out of JUG free with this pass! Simply cut along the dotted lines and present to the JUG Master to excuse yourself.